Anyway, the dentist and hygienist were in agreement: The tooth was fractured. I was pretty distressed, because it had been only two years since the root canal, and because I've been extremely busy lately and didn't want to spend time or money on dental stuff. As much as I've enjoyed reading about OTHER people's experiences with implants, I wouldn't feel deprived in the slightest at not having one. Nevertheless, I bit the bullet and sent a semi-frantic email off to Dr. P. He responded fairly promptly, and asked to see the x-ray. I was chagrined to admit that I didn't have anything to send him; my local dentist still uses his 30-year-old machine from deep in the pre-digital era. Dr. Gonzalez (who rarely attends to email) also chimed in and stressed that fractured roots could impair implants because when the body tries to seal off the infection, the underlying bone shrinks. That makes the implant precarious. Was there pain or swelling?, they wanted to know. No, just a telltale x-ray. More worried than ever, I promised to find a dentist with a digital x-ray machine as soon as possible. Of course, this happened on a Thursday afternoon, which is basically Friday for dentists here in North Carolina since they usually take Fridays off. After a worrisome weekend, I located a dentist willing to take a pic. It was taken Tuesday morning (for $44). An hour later it was on its way to Costa Rica on wings of electrons. Dr. Prada, Dr. Carranza and Dr. Gonzalez all looked at it and said it looked fine: no sign of fracture or bone shrinkage or anything else. I talked with the dentist's office about why they thought it was fractured, since I was curious to know. Apparently the old x-ray equipment doesn't have the resolution of the new digital ones, and movement might affect how it looks, and...okay. Not sure what to make of all this, but I now realize that I need to find a local dentist with up-to-date equipment to monitor my teeth. Once again, I've learned to not take anything for granted regarding dentists. So that's it. I thought I'd update you on my latest faux dental adventure. Now I have to get back to work. Well, it's that time of year again... Time for the May Updates on the Topix forum. This will be the second annual May Updates. Last year was the inauguration of this tradition. I had this idea back in late 2013, when the Topix forum was going through one of its periods. There were a lot of off-topic posts back then and some back-and-forth arguments going on. My idea was to have a lot of dentist reviews posted at one time in the year, allowing interested newbiews to just read a few days or weeks of posts to get the general flavor of things. Furthermore, I thought it would be an interesting idea to have folks look back on dental work that had been completed months or years earlier and tell us what they thought. Most dental patients give their dentists glowing reviews immediately after the work is completed, but problems usually don't become apparent for weeks or months. So that was the idea behind the May Update tradition. For the May 2014 Jamboree Update, I emailed dozens of old posters and tried to convince them to post. Many did, but many ignored me. This year I emailed just three people (who all ignored me). So the eight people or so who have posted so far have done so spontaneously, for which I am grateful! >>> I posted an update on my dental work from Dr. Prada. It was a belated admission that I don't like root canals, which is what I always thought. I'm still happy with the work, but I wish I had a time-machine so I could have had it all done by Dr. Prada back in 1995 when the first set of 28 crowns were placed. He fixed a lot of the problems stemming from the 1995 crowns when he worked on me in 2010/2011. But it is just so much easier (and less expensive) to have dental work done right the first time. >>> I see a sour note regarding Dr. Castro by one of the posters. I appreciate honest posts like this. (And in my opinion, asking folks to contact him privately is the best way to handle cases like this.) I posted a reminder to him to "Register" so that folks would be able to Private Message him if they wanted to follow up. I remember seeing another post from a patient of Dr. Castro's (maybe by the same poster, I don't remember) in last year's May Updates (sometime in May 2014, obviously). >>> I don't understand Infoseek's comment (#6996). Is this directed to me or to someone else? I don't know. It's very easy in a public forum to write a post that seems perfectly clear to the original poster, but leaves some readers scratching their heads. I've written many such posts. This is another reason why I recommend that people with complaints reserve their hardest-hitting shots for private discussions, where the criticism is less likely to be misunderstood. >>> As usual, my posts get flagged. There are one or two guys who hold a grudge against me and flag my posts routinely. Eventually, they will get bored and go away. But until they do, the ratings no longer make any sense because of people like that. Readers of the Topix forum last year were treated to a round of reports from one of our intrepid dental tourists. 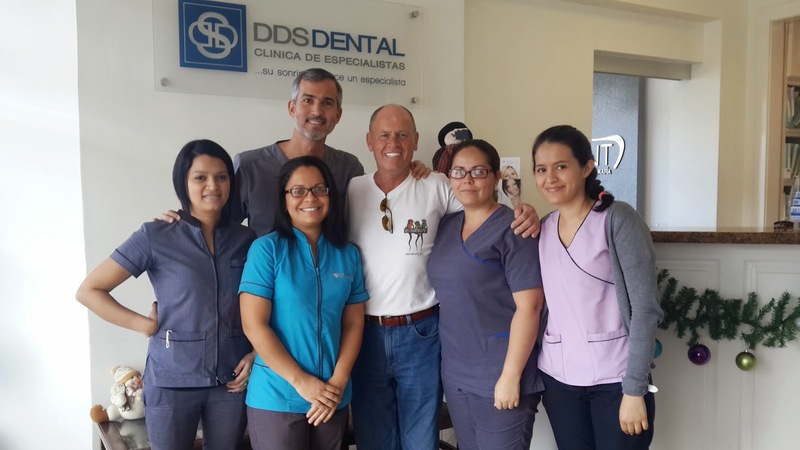 "EssKay", otherwise known as Stephen, had a full-mouth reconstruction done at DDS Dental with Dr. Prada and Dr. Gonzalez. He sent me his photos so everyone could see them, as he doesn't have a blog of his own. Glad to oblige, Stephen. I read a lot of his posts on Topix and even corresponded with him, but it was only when I saw his photos that I understood his situation. Stephen had his work done at DDS Dental by Dr. Prada and Dr. Gonzalez. It was completed in December 2014. He had 8 implants on the top and 6 implants on the bottom. The bridge material is Prettau "full-contour" zirconia from Lorenzo Favini's dental lab. These are solid zirconia bridges, without a porcelain facing. (I think that this might be a slightly improved version of the Prettau in my crowns from 2011.) Lorenzo likes to make his crowns and bridges as life-like as possible. If you look closely, you'll notice that the color is a shade darker near the gum line, and that the individual "teeth" have ever-so-slightly wavy edges. These artistic effects are a hallmark of his lab. See the "gums"? Those are actually part of the bridges, painted as gums. It was quite an event for Stephen. As I remember, he had a rough time recovering from all the procedures. But he got a great smile out of it! My arrival at DDS was predicated upon faith. After reading all the posts on the forum, I started focusing on Dr. Prada. This was mainly the result of reading what you and Rod [of thedentaltourist.com fame] had to say. So when I had my first appointment in Costa Rica, I was really at the mercy of the gods and the fates. It was determined that all my teeth had to go. Thankfully, I'd mentally prepared myself for that eventuality for a couple of years prior to making the decision. I knew the front teeth were a lost cause, but I thought that some of the molars were salvageable. The truth is, even they were loose (though not all of them obviously so). It was easier to start from scratch. 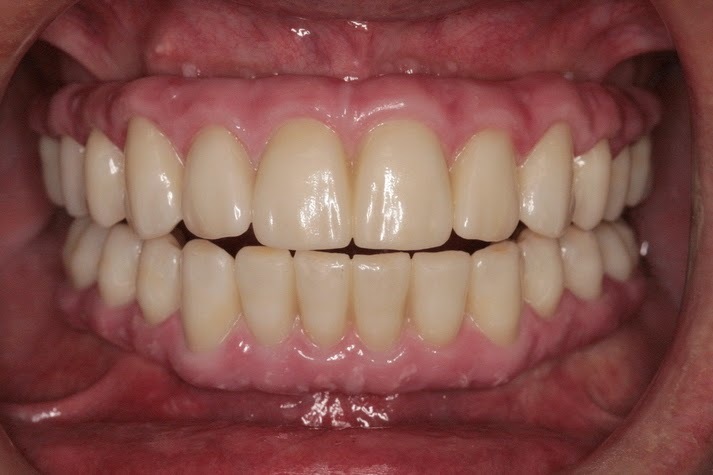 Because of receding gums, it was determined that full bridges were the best option. The alternative of several bridges would have left me with an unsightly gum line when smiling. This was compensated for by having full bridges with the "gums" a part of the bridges (i.e. all the same material, Prettau Zirconia, but the "gums" painted and baked in. That was pretty much it. Of course, I went through quite a bit of mental turmoil during these procedures, but that's too subjective to be of any use to others. The mental oscillations of each individual tend to color true perceptions. By the way, should anyone wish to contact Stephen directly, the best way is to send him a Private Message through the Topix forum. For example, see post #6649 on the long thread. Click on the envelope icon in the left pane to send him a PM. Stephen's the one in the white T-shirt, flashing his final bridges. Next to Stephen is Dr. Prada, and on the far left is Dannia, his long-time dental assistant. Stephen says, "I think the photo shows the respect and love I felt for all those at DDS. I wasn't the easiest of clients, but Dr. Prada was/is a gentleman and a consummate professional." Thanks for the photos and the report, EssKay. Someone on the Topix forum recently asked, Who is good with veneers? This is not the first time this question has come up, but it's the first time it's come up when I had my own blog to give my take on it. Veneers aren't a secret occult science, nor are they a specialty area in itself. There are several specialty areas of dentistry, but "Veneerology" isn't one of them. Rather, veneers are a part of prosthodontics, the specialty that covers crowns and bridges. A dentist who is very skilled and successful with crowns, bridges, etc, should also be able to do good veneers. Not being a dentist nor even having any veneers myself, let me just do some blue-sky thinking. It seems to me that placing a veneer requires the same skills dentists use to place crowns, only more so: An aesthetic sense to judge the color and select the material what would best work in a given situation; a feel for the strength of materials and cements to judge whether a given veneer would hold; technical laboratory skills to fabricate such veneers to such precise tolerances; and manual dexterity to prep the surface correctly. In other words, it's just like setting crowns, only more difficult. At least in the judgment of this layman. I think that this question arises from some bad experiences some patients have had with veneers. 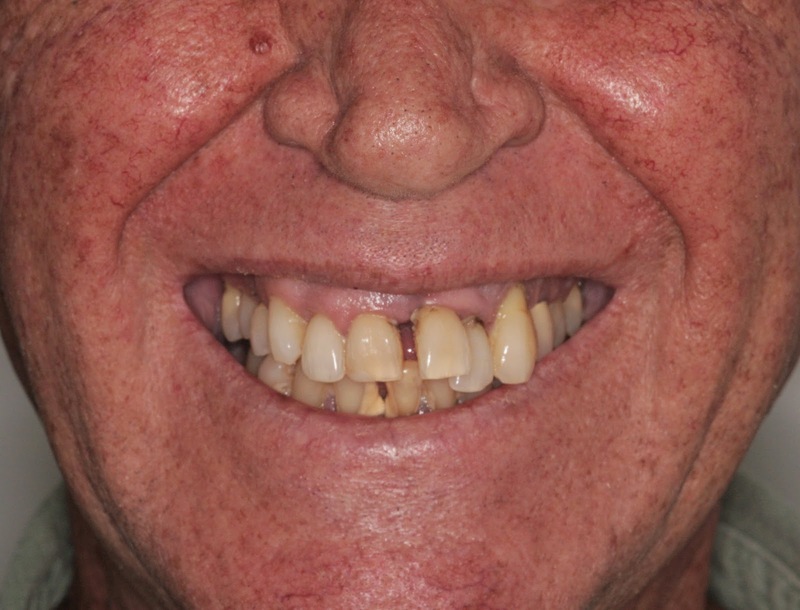 Veneers are very likely more difficult to successfully acheive than crowns. I suspect that some dentists whose skills are adequate to place crowns simply lack the additional skill and judgement required to do veneers. Hence this concern. If you need veneers--or any other type of "cosmetic" dentistry, for that matter--you should choose a highly skilled dentist, rather than the first one that pops up on your Google or Yahoo search. There are some very good dentists on this blog. My first impulse would be to check out some of the specialists in prosthodontics. These dentists have studied advanced cosmetic procedures under a master in their graduate programs. Some of the other general dentists might well have acquired the experience and skills required for these procedures, but I can't speak to that. Two years ago I talked with someone who wanted dental work done in Costa Rica for purely cosmetic purposes. There wasn't anything wrong with his teeth, he just wanted to look better. Nothing wrong with that. The trouble was the clinic he had chosen--a clinic so mediocre that it had trouble just doing the basics. Like crowns. 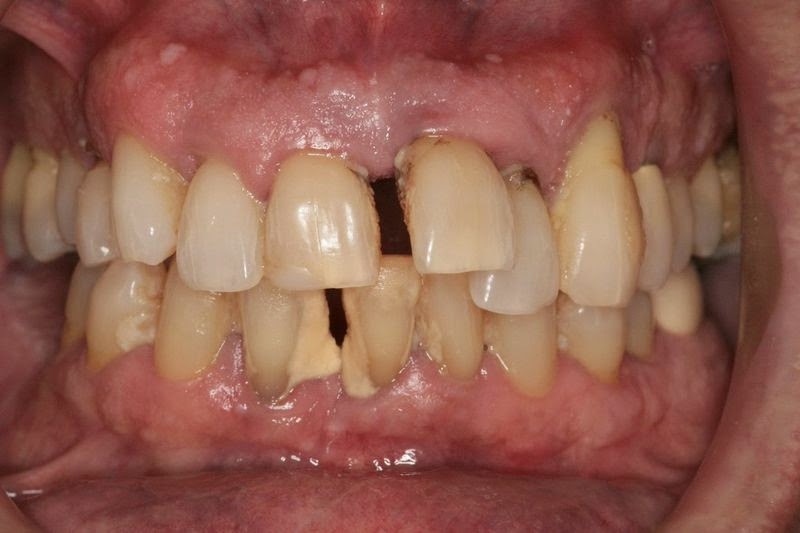 A clinic that can't even do basic dentistry reliably cannot be expected to succeed in something much more challenging. After a long conversation, I was able to talk him out of his plan. For this good deed alone, I fully expect to have secured my spot in Heaven. If you want dental procedures for purely "cosmetic" purposes, you need to find someone who has excellent judgment and integrity in weighing the "downside" of the procedures you're considering, as well as having the skills to successfully accomplish it. You want someone who can preserve what's working for you and just make it look better, not someone who will give you new dental problems. "Who's the best dentist in C.R. for VENEERS?" I had a long phone conversation with a would-be dental patient recently who was on the verge of a visit to C.R. to check out dentists. A couple of isues came up that might be of general interest. Cost was an issue for her as it is for many of us. After all, that's one reason why we're looking at Costa Rica. For price-conscious patients, I always mention Cavallinis and Costa Rica Dental Team. Both clinics do both full-mouth restorations and implants, but I think that the Cavallinis are particularly good to look at for economy-priced implants, and CRDT for crowns. Another issue was scheduling procedures for implants with Dr. Gonzales. She tried to contact Dr. Gonzales first and I guess that sort of surprised me until I thought about it. Dr. G. is the implantologist (and periodontist) for Dr. Prada of DDS Dental, and so it would be natural for many US patients to make the contact with him since he would be doing the implants. I think this may be how it works at some C.R. clinics (Dr. Anglada and Dr. Castro-maybe? ), but the best and easiest procedure here would be to let Dr. Prada handle everything. Let him be the point of contact, and if he thinks you should contact Dr. G directly he'll tell you. This is the how both R.J. and I handled our procedures with Dr. G., implants in RJ's case and crown lengthenings in mine. The beauty of this arrangement is that if something ever goes wrong, you just contact Dr. P., and he'll figure out how to fix it. I love that Dr. P and G work so well as a team. All the dentists mentioned here have their own entries on this blog under "The Dentists".